Now that you are done with your studies, you must be on the lookout for your dream job. So, have you decided on the field in which you would like to start your career? 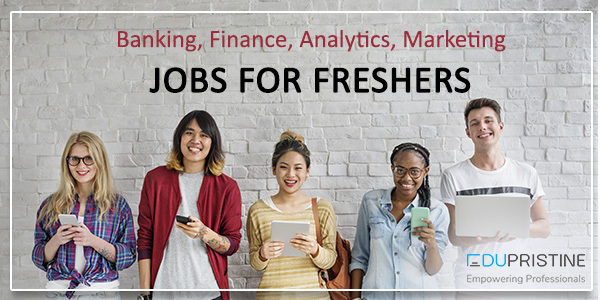 In this blog, we have compiled a list of jobs that are open to the freshers mostly from the field of banking & finance, accounting, digital marketing and business analytics. Research Analyst: A research analyst is also known as a financial analyst, securities analyst, investment analyst or equity analyst. It is his job to analyse the financial records of a firm for its clients. He gives reports and notes to the clients after analysing all the information that a client would want to know. Portfolio Manager: A portfolio manager is a person who takes investment decisions regarding to the money of other people who have given the control of that money to the manager. A portfolio manager may also be in charge of a firm’s asset and liability (loan and deposit) portfolios. Financial Advisor: As the name suggests, a financial advisor advises and provides guidance to people and firms on investments and finance related decisions. They help the firms/individuals take the rights decisions so as to make the highest possible profits. Risk Manager: A risk manager is a person who can predict all the risks that a firm or an individual might face in the future pertaining to their money and who helps them manage the same. The role of a risk manager/analyst includes coping up and avoiding such risk and analysing its effects. Consultant: A consultant provides professional advice and suggestions about the functioning of a firm that will benefit the firm. They can be hired internally by the firm working for the company or hired externally giving help and advice to the company. Investment Banking Analyst: An investment banking analyst is a person who researches and analyses all the possibilities of an investment. He directs the investment process and makes individuals and firms aware of mergers and acquisitions. He researches investments for fund managers, so decisions can be made on portfolios that the bank manages. Corporate Financial Analyst: Corporate financial analyst is a person who follows and analyses an assigned company’s financial workings – like studying the financial statements, expenses, tax rates and the like – in order to comprehend where the company makes money and where the company loses money so as to streamline the workings of the company in order to make as much profit as possible. Apart from these, there are many other jobs available in the finance sector. You can go through these articles – https://www.edupristine.com/blog/career-prospects-for-cfa or https://www.edupristine.com/blog/what-is-frm-2 to get a better idea about the same. Finance Manager: A Finance Manager with CMA certification is the locus of operational decisions. If you are up for engaging in forecasting, planning and budgeting, you need to have in-depth knowledge of the financial industry on one hand as well as be able to communicate clearly with clients and senior colleagues on the other hand. Financial Controller: The role of financial controller is a very crucial one to the finance department of any company. If you aspire to pursue this role, then you will be expected to be the whole and sole of the finance department. Analyzing accounts books, auditing, carrying out the administrative tasks, overseeing tax issues, formulating financial strategies are all the daily tasks that a Financial Controller has to undertake. To become Financial Controller, multi-tasking, analytical and communications skills are required. Cost Accountant: If you have good business sense and a willingness to organize complex numerical reports in timely fashion, then a CMA certification will help you in your goal of becoming a cost accountant. A cost accountant is expected to perform margin analysis and monitor cost information. He is responsible for planning, studying, and collecting data to determine costs of business activity such as raw material purchases, inventory and labor, analyzing data collected and recording results. Management Consultant: The objective of the management consultant is to provide solution to any current or future problems of the firm. The management consultant gives advices and suggestions on all the vital matters of the company. The firm seeks out his advice while preparing the plan for the company. A management consultant helps an organisation to solve issues, create value, maximise growth and improve business performance. He uses his business skills to provide objective advice and expertise and help an organisation to develop any specialist skills that it may be lacking. Tax Consultant: A tax consultant typically expands on the role of tax preparer. While a tax consultant prepares tax returns, he also often works closely with clients throughout the year to ensure client tax liability is minimized. A tax consultant deals with matters related to corporate tax as well as other types of taxes that are taken to him. He handles all the matters related to tax and subsidies along with government related matters. Auditor: An auditor is a specialist who reviews the accounts of companies and organisations to ensure the validity and legality of their financial records. He can also act in an advisory role to recommend possible risk aversion measures and cost savings that could be made by examining company accounts and financial control systems. An auditor goes through the company accounts and the balance sheet and reviews them for any mistakes. He is like an editor of accounts. He too has to act as an investigator so as to try and find the smallest of mistake. Business Analyst: Requirements Are the Core of the Business Analyst’s Role. Business analysis training teaches requirements management – one of the core skills of business analysts. Developing technical solutions to business problems, or to advance a company’s sales efforts, begins with defining, analyzing and documenting requirements. Your main tasks will include performing detailed requirements analysis, documenting processes, and performing some user acceptance testing. Hence, to succeed in this role, you should have a natural analytical way of thinking and be able to explain difficult concepts to non-technical users. Fraud Analyst: A fraud analyst has many responsibilities. A few of them are – Monitor real-time queues and identify high-risk transactions within the business portfolio. Observe customer transactions to identify fraudulent activity such as account takeover, friendly fraud, theft and similar other risks. First, Identify fraudulent transactions and cancel them from further processing. Then resolve queued transactions within the service level agreements to reduce potential revenue losses. Accordingly, Interact with banks and customers to validate information and to confirm or cancel authorizations. The job description of financial analyst includes improving financial status by analyzing results; monitoring variances; identifying trends; recommending actions to management. Thus, Identify financial status by comparing and analyzing actual results with plans and forecasts. There are other job roles like marketing analytics manager, supply chain analyst, pricing analyst, website analyst. Also, retail sales analyst, clinical analyst, etc. 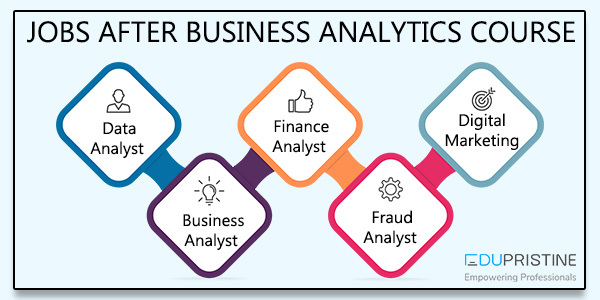 open to a fresher with business analytics certification. You can visit our business analytics page for more information on the same. There are myriad job opportunities for freshers with a digital marketing certification. Accordingly, we have covered the same in another blog. You can go through the blog here to know about these job opportunities. Therefore, I hope you would have found this blog an entertaining, interesting and knowledgeable read. As a result, you can apply for any of the above jobs as per your qualifications, expertise, certification and interest. Best of luck with your career!